Strength and Conditioning is back this Sunday at 5:45pm! With all the competition activity, we’ve missed a few weeks. Here are the rest of the dates to put in the diary! Cost: Six sessions for €45, payable online via EasyPaymentPlus. 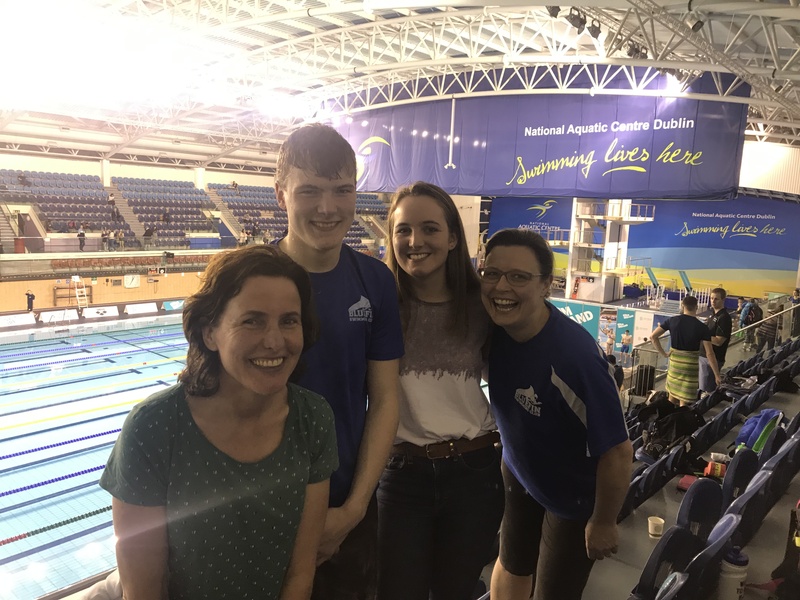 Bluefin’s Robin Pfeiffer represented the club at the premier meet of the season, The Irish Open Championships 2019 in Dublin last month. Competing in six events over three days, Robin’s exceptional dedication to training, and his performance on the day, showed as he made two finals – and achieved personal best times in every swim. Robin entered 400 FS, 400 IM, 50 BK, 50 BF, 100 FS and 800 FS. Most impressively, Robin broke the five-minute barrier during the heats of the 400m IM, with a 9 second PB to make the A final later that evening. He then went on to better his time in the finals, after coming fourth place in the 800m FS! No mean feat! The club will be electing club captains for the 2019/20 season this week. 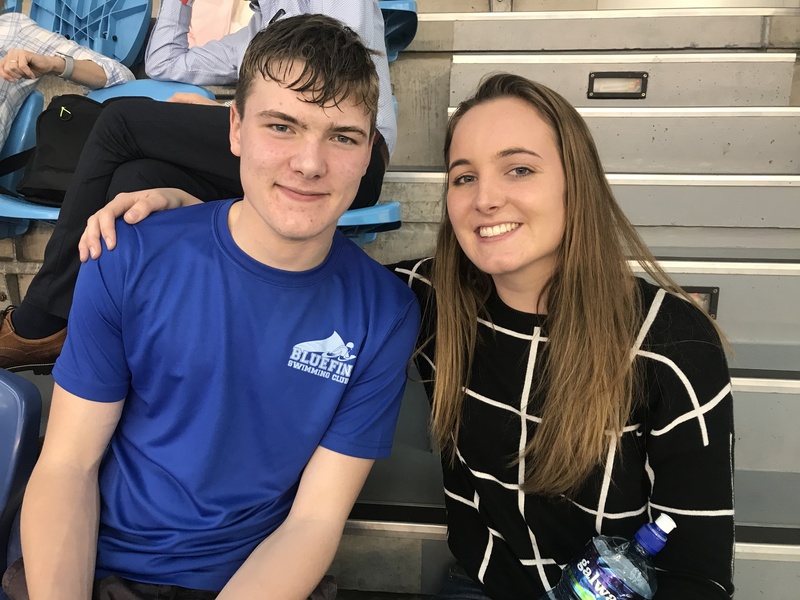 The team requires one male and one female senior swimmer to represent the Competitive and Performance Squads; and one male and one female to represent the Skills and Development Squads. If your athletes are interested in the role, please read through the role description below before notifying Tom by text, Whats App or email bluefin.chairperson@gmail.com. Nominations must be in before the end of Sunday 7th April 2019. The nominees will be announced by email on Monday 8th April, and the team will vote for their captains during the sessions next week, with the results being announced on Friday 12th April. The Club Captain provides a central point of contact, and is the vital link, for athletes within the club. The role of the Club Captain is to represent the views of the athletes and contribute to the development of the club by providing thoughts and comments from an athlete perspective. • Be a person that all athletes can contact and talk to about any comments or questions they may have. • Provide a voice for athletes at the club and raise any issues to the committee when necessary. • Be a positive role model for all members of the club. • Communicate with fellow team members and provide support and advice where needed. • Encourage club members to be involved in social and voluntary activities. • Welcome new members to the club. The duties and responsibilities of a Club Captain will vary, but the ideas above can be used as guidance for you to think about what your role should be and what you can offer to your club as Captain. • Enthusiastic with a good knowledge of the club and athletes. • Have the ability to seek and represent the views of others. • Be an excellent communicator with good verbal, written and IT skills. This will vary from club to club, but being a positive role model is something you can do all the time! Discuss with your club what they expect from you in terms of other duties before taking on the role to ensure you are able to fully commit. This will vary according to club constitutions and election processes. Some clubs stipulate that a new Club Captain should be elected every year, whereas others will fill the role via an annual election process, meaning one person can hold this position for a number of years. Most clubs have separate male and female Club Captains and some may also choose to elect Vice Captain(s). • Always be on time or even early for meetings, training or events. • Offer to help and support others, e.g. help to set up lane ropes, help other volunteers at events, etc. • Find time to speak to and listen to the views of others at your club, e.g. attend a squad session of younger athletes to let them know who you are and find out what their needs are at the club. • Be positive and constructive in your views. In raising ideas and suggestions to the Club Committee or to others, always try to focus on the positives and the outcomes of the point you are trying to make. What could a Club Captain do? • Introduce a suggestion box for athletes to write down and post their thoughts on the club. • Provide ideas and suggestions to the Club Committee on areas to develop the club, e.g. the club website, developing e-newsletters for the club, developing kit identity and choosing team kit and trophies/prizes, providing ‘young people’ information for the club handbook, developing a code of conduct for athletes at the club, etc. • Offer to help at recruitment events for the club, e.g. help out at a school festival, hand out leaflets about the club, help at fundraising or promotional events, etc. • Mentor other young people and help them to develop their skills. Be a motivational and proactive member of the club, both in training and at meets, setting a good example in terms of work ethic and also encouraging other athletes. This list only provides you with some examples. You can work with your fellow Club Captains to come up with ideas of your own which suit your club. What opportunities does a Club Captain role offer? • Having fun and working with others. • Learning and developing new skills and ideas. • Representing the views of young people. • Developing personal skills, e.g. confidence, team work, social skills. • Learning about the administration and structure of a voluntary organisation. • Adding this position and experience to your curriculum vitae (CV). • Knowing that you are helping others. • Progressing towards a qualification/award in volunteering and leadership. Squad moves for Term Three take effect on Monday 8th April 2019. Please inform committee, at your earliest convenience, if you are not accepting a squad promotion. Declined places can be offered to another athlete. Please note, Squad Level Three and Level Four are now full. Athletes with less than 80% attendance, may be asked to move to another squad. 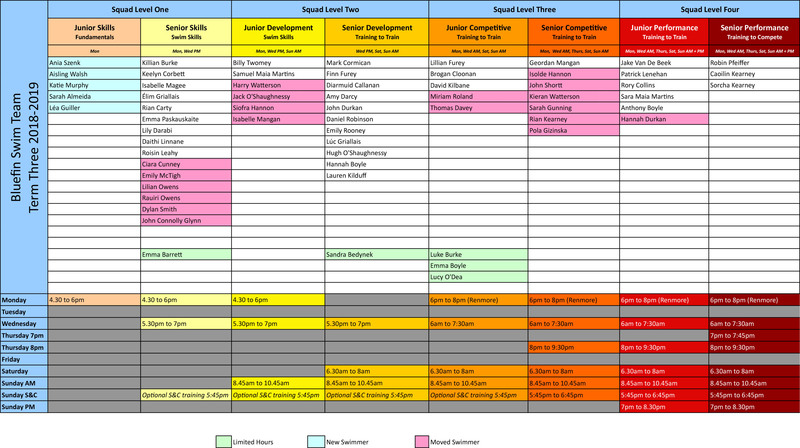 Limited hours are agreed by head coach and available to Squad Level Four swimmers only, who are in junior/leaving certificate years and/or are multi-sport athletes.